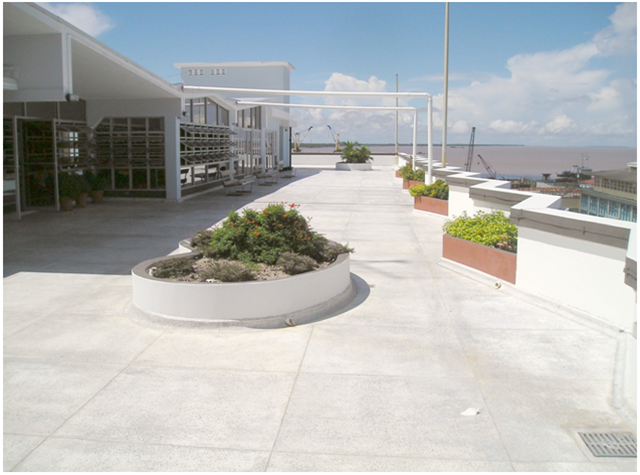 Weathershield was contracted as a specialist waterproofing contractor to remove and replace the roof system on the roof level terrace of this prestigious building in Georgetown, Guyana. The scope of works included to remove and cart away the old terrace paving and roof system, and to supply and install new lightweight Cellular insulating concrete drainage screed enhancement to the existing roof deck and install a new monolithic mastic asphalt waterproofing system complete with perimeter skirting and termination. Also to install a new Carlisle MiraDrain Drainage and Protection Board as a substrate to receive the terrazzo floor finish and planter growth media placed over it. This work was completed on a live occupied building and this project required a very high degree of co-ordination with the Project’s Architect and General Contractor to ensure that in areas where the old waterproofing system was removed, the drainage grades were enhanced and exposed surface made watertight in short order to minimise consequential damage to the building interior below.